The laboratory of Nonlinear Analysis and the Design of New Types of Vehicles was established in 2010 on the base of the Institute of Computer Science of the Udmurt State University (UDSU). The founder of the laboratory is an eminent Russian scientist, Corresponding Member of the Russian Academy of Science, Treschev Dmitrii Valeryevich. 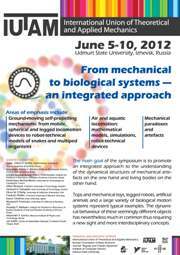 The major avenues of inquiry are intimately connected with modern robotics, applied mechanics and control theory. The key research objective is the design and implementation of new means of terrestrial and aquatic locomotion. The general aims of the laboratory are the improvement of maneuverability of existing vehicles (design of new types of wheels) and the development of new types of vehicles for space and extraterrestrial missions. The laboratory will manage the development of projects through a complete development cycle from project analysis, concept and preliminary mathematical model to construction of prototype vehicles.